Migrating Eastern North American monarch butterflies use a time-compensated sun compass to adjust their flight to the southwest direction. 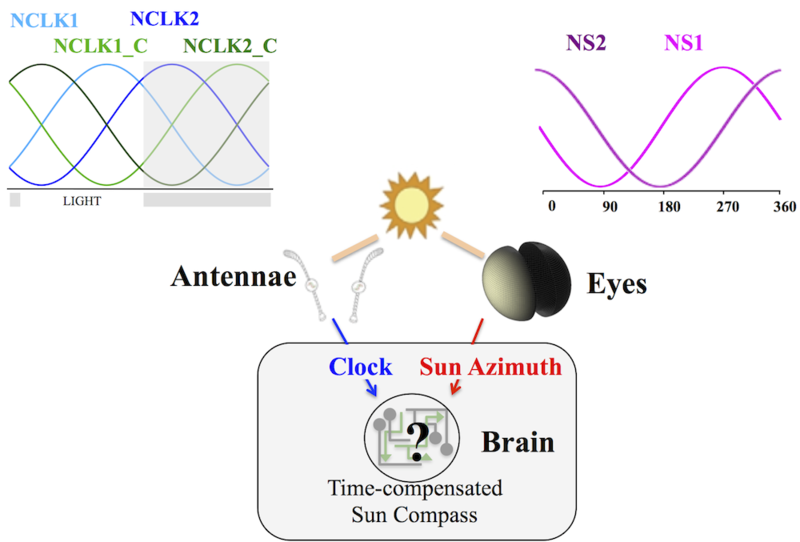 While the antennal genetic circadian clock and the azimuth of the sun are instrumental for proper function of the compass, it is unclear how these signals are represented on a neuronal level and how they are integrated to produce flight control. To address these questions, we constructed a receptive field model of the compound eye that encodes the solar azimuth. We then derived a neural circuit model, which integrates azimuthal and circadian signals to correct flight direction. The model demonstrates an integration mechanism, which produces robust trajectories reaching the southwest regardless of the time of day and includes a configuration for remigration. Comparison of model simulations with flight trajectories of butterflies in a flight simulator shows analogous behaviors and affirms the prediction that midday is the optimal time for migratory flight. Each fall hundreds of millions of monarch butterflies perform a spectacular journey from Northeast America to Central Mexico. To aid with navigation, monarchs are using a time-compensated sun compass to maintain southerly flight. Video from outdoors monarch flight experiment. Froy et al. 2003. Source: Reppert lab. experiments performed in Guerra et al. 2012. What are the neural mechanisms which could implement such a compass? We present a model that integrates neuronal oscillations of the sun’s horizontal position and the circadian clock to direct flight. The model explains flight simulator tracks and proposes a space-time integration mechanism for directional flight. Monarchs have a circadian clock, housed in the antennae, capable to keep track of time-of-day and to control the sun compass timing. Previous work has shown that cells in the tissue of the antenna express transcriptional factors oscillating according to 24 hours rhythm and the antennae are critical for directional southerly flight. We perform recordings of electrical signal in the antennae and find similar oscillations. 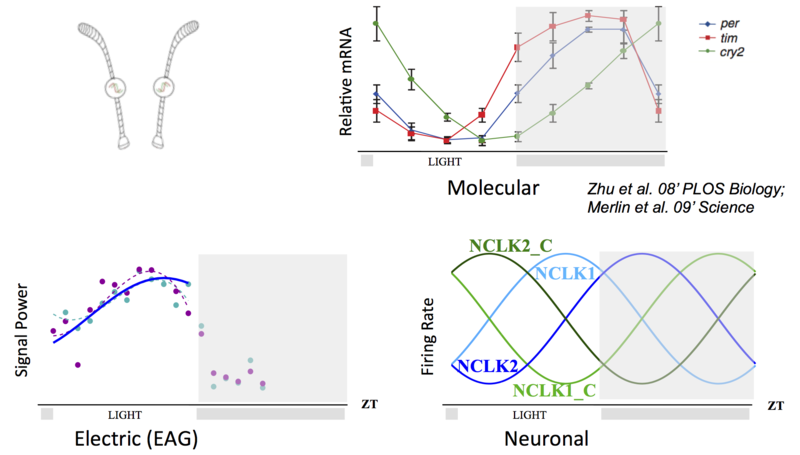 We thus define neurons of type "NCLK" which are clock neurons that encode time of day with neural activity (spiking rate) aligned with the transcriptional factors oscillations. Solar azimuth is detected by the monarch's eyes which are shaped as half spheres separated 180 deg from each other and composed of many individual lenses (ommatidia). While the exact mechanism for solar azimuth reception is unknown it is expected to be a robust and simple mechanism. * Photo credit: Yung, Samuel http://samuelphotos.com We propose a mechanism that relies on integration of luminance from a wide field (a whole hemisphere). It is based on Lambertian reflectance principle that the maximal luminance is absorbed by ommatidium with surface normal aligned with the sun and dissipates as a cosine the azimuthal angle. Therefore integrating total luminance over large spherical area will provide a good estimate of the angle of the sun with respect to the eye. Such integration strategy will produce luminance curves of sinusoidal type shown above. 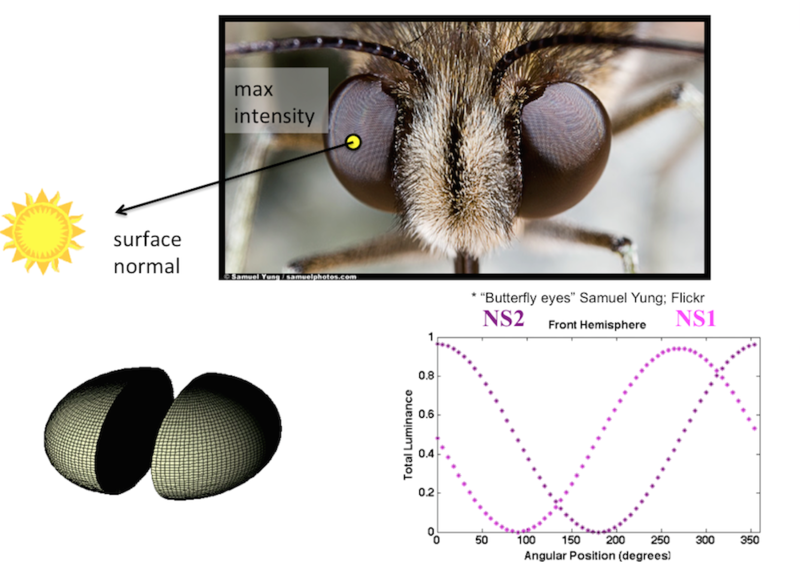 We define neurons of type "NS" as azimuth neurons that encode the horizontal position of the sun with respect to the butterfly by producing spiking rate aligned with total luminance. We then develop a neuronal circuit which integrates circadian and azimuthal signals to correct flight. In such a circuit there are two neurons, "L" and "R", which receive circadian ("NCLK") and azimuthal ("NS") signals and encode the angular velocity towards left or right directions with their neural activity. We have examined all possible integration wirings and have found only two wirings that support robust orientational flight throughout the day. Surprisingly, one wiring supports Southwest bearing (used by migrants in the fall) and another supports the Northeast bearing (used by remigrants in the spring). To test the time-compensated sun compass mechanism we computationally simulate the neuronal network. We also simulate the sun's position at different times of day and account for disturbances that could affect the detection of sun's position and incorporate disturbances that could displace the butterfly. Examining flight tracks from our simulator versus those in outdoors experiments we observe similar features and predict the direction into which the correction will occur for each angular position. We find that there is a "separatrix" angle, which separates correction direction to left or right (blue dial). This finding explains the appearance of rotations in attempt to correct flight direction due to disturbances (compare the track on the right with above outdoors flight track). The position of the separatrix is not fixed and rotates throughout the day. It is located close to the Southwest in the morning and evening times. Thereby we predict more frequent rotations in attempt to correct flight during these times, as observed in previous experiments. Taken together our results demonstrate a simple neuronal integration mechanism, based on matching spiking rates of clock and azimuth neural signals to provide angular position control. Such a mechanism is necessary for monarch butterflies to make this remarkable journey and reach their overwintering sites relying on limited food sources on their flight path. The work is a collaboration of University of Washington (Shlizerman group), University of Michigan (Forger group) and University of Massachusetts Medical School (Reppert lab). It was funded in part by the National Institute of Health, Air Force Research, National Science Foundation joint with National Institute of General Medicine, Washington Research Foundation Fund.